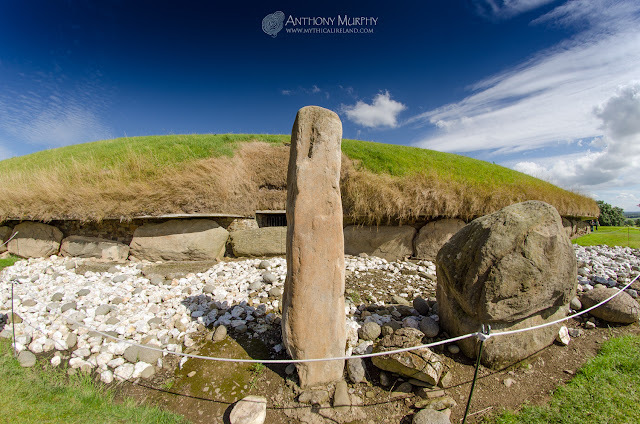 Mythical Ireland blog: What is the meaning of Knowth's pillar stones? What is the meaning of Knowth's pillar stones? A large sandstone pillar stands outside the entrance to the western passage at Knowth. The meaning of this pillar, and a similar but smaller one on the eastern side, is not known. They appear to be somewhat phallic in nature, and both are accompanied at a short distance by two large "testes" stones. The sandstone pillar and stone settings outside Knowth's western entrance. At Knowth, the white quartz has been left in situ, on the ground, where it was found during excavations, which is contrary to the reconstruction of Newgrange, where the white quartz found on the ground beneath the cairn slip was once thought to have been on the front of the mound, forming a near-vertical wall, and thus Newgrange has been reconstructed that way. The quartz at Knowth is interspersed with water-rolled granite cobbles identical to those found at Newgrange. The interpretations are different. Perhaps the two monuments were built differently? Knowth west at equinox. Click to enlarge. There is no easy explanation for the presence of the pillar stones at opposite entrances. Martin Brennan (The Stones of Time, 1984) has noted the interplay of the shadow from the stone at the western side (pictured above) with a vertical line on the centre of the stone immediately outside the entrance to the passage around the time of the equinoxes, when the sun's light reportedly illuminates the passageway. (It does indeed illuminate the passage, as I witnessed and photographed in September 2000, but the maximum reach of the sun into the passage does not occur for another couple of weeks after this, around October 3rd). 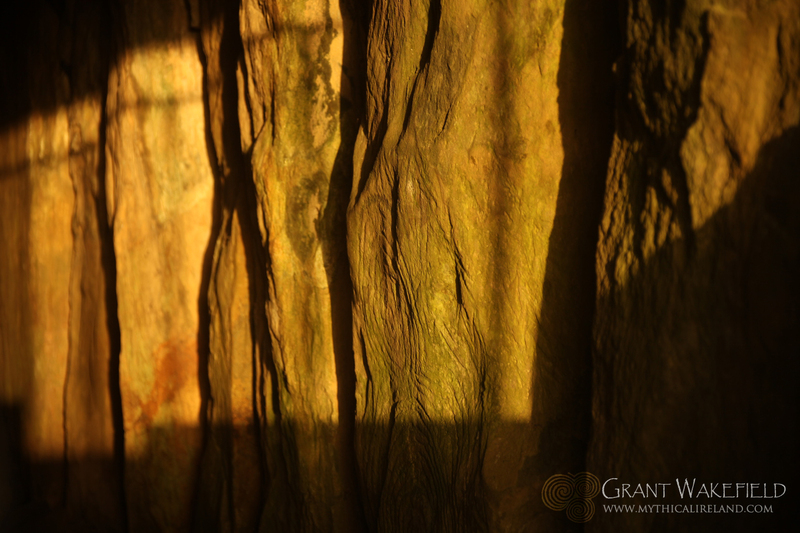 The photo on left shows the illumination of the orthostats along one side of Knowth's western passage at autumn equinox. This photo was taken by film maker Grant Wakefield on September 20th 2010. The eastern pillar stone, visible from the pedestrian footbridge at the entrance to Knowth East. The stone pillar outside the eastern entrance is much smaller, and is made of a different type of stone. Unfortunately, alterations to the outer portion of the eastern passage in medieval times due to souterrain construction have meant the outer section of this passage has a bend in it, precluding light from travelling into the eastern passage/chamber around the equinoxes. The addition in recent times of a bridge and a concrete door surround (see photo above) have further exacerbated this problem. Is there an argument, I wonder, for the removal of part of the souterrains in order that any possible alignment with the sun be investigated? 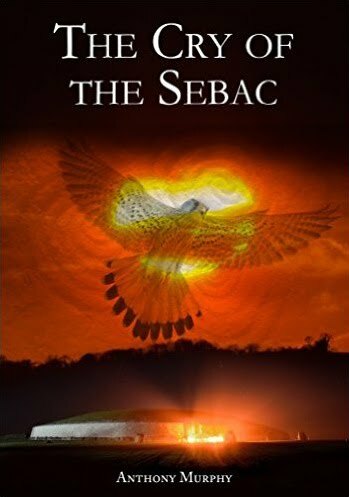 Could we once again (for the first time possibly in thousands of years) witness the sun illuminating the cruciform eastern chamber of Knowth, in a way similar to the solstice illumination of Newgrange? I live in hope. It might still be possible to witness and record any interplay between the shadow of the pillar stone (gnomon?) at Knowth's eastern entrance around the time of the equinoxes. One wonders if anyone has ever witnessed such an interplay. Such studies (of both east and west entrances) could prove very valuable in revealing any subtle astronomical functions of these entrance settings. These stones undoubtedly had a purpose and a reason for being there in the minds of the builders. Another interesting facet of the sandstone pillar outside the western entrance is that it is quite polished on the side facing the mound - as if it had been rubbed smooth over a period of time. One wonders if there might have been some ritual involving the touching of this stone over a long period of time in antiquity. The story about the Lia Fáil (another phallic or pillar stone) at Tara and how it screamed when the rightful king touched it brings to mind the idea of perhaps many people touching a stone to receive some sort of blessing or luck from it. Perhaps they kissed the stone, like kissing the modern-day Blarney stone? Who knows? 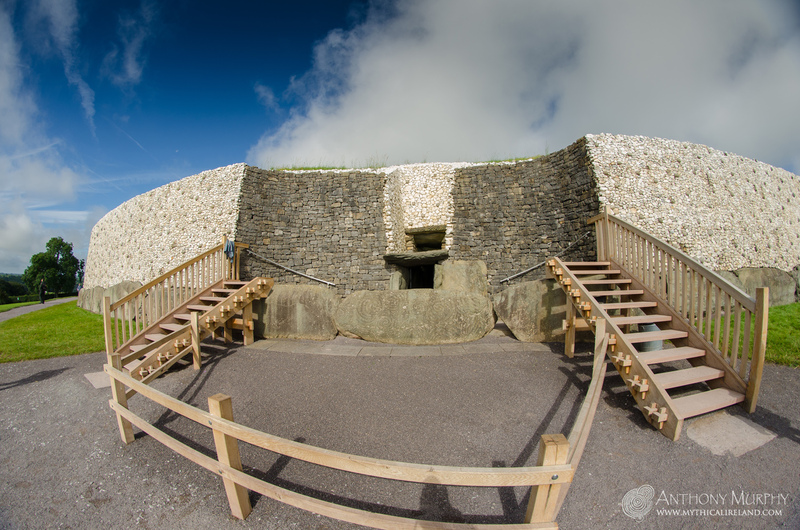 The modern entrance to Newgrange. 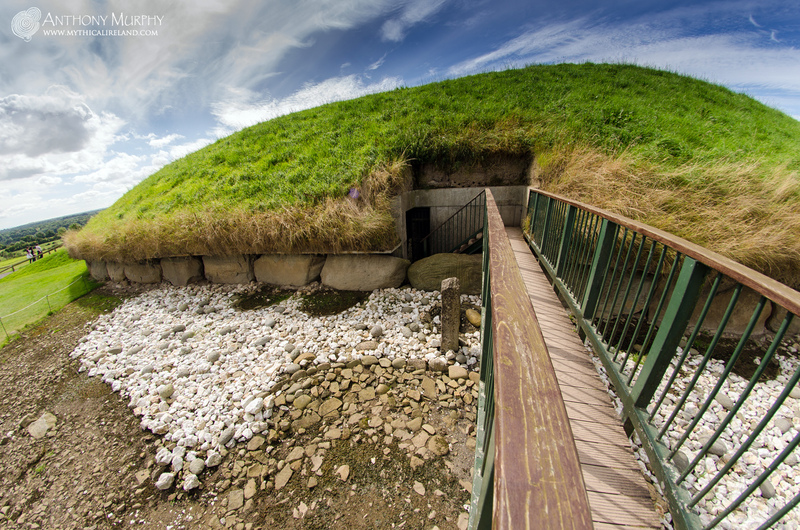 Yet another interesting aspect of the Knowth entrances is that, with the preponderance of stones carefully placed and set out in front of these portals, it must be assumed that access into the passageways was not easy, and was perhaps undertaken by only the chosen few? Indeed at Newgrange the only reason tourists can access the passage and chamber today is because (a) the entrance area was widened, and set back from the kerb to accommodate people and (b) wooden steps were installed so that people don't have to clamber over the entrance kerb stones, thereby slowly eroding and damaging them. The entrance is shown in the photo on right (click to enlarge), in this somewhat exaggerated fisheye-lens view. But you get the picture. A shallow basin-type feature outside Knowth east, replicated on a smaller scale at Knowth west, may have perhaps held water for some sort of ceremony - absolute speculation on my part, but the study of these things is necessarily subjective. Unfortunately, a similar circular-shaped stone setting outside the entrance of Newgrange, in which a stone phallus artefact was found, was removed during excavations and not put back afterwards. Perhaps there were more similarities between these sacred entrances than we might have considered. One thing that seems clear is that there was an intentional liminal aspect of the entrances. These are boundaries, thresholds. The kerb stones outside Newgrange as well as Knowth East and West are all lavishly designed. Settings of stone on the ground were perhaps associated with rituals held outside the entrances in ancient times. One wonders if the builders of these magnificent structures were to somehow magically venture forward in time to today, would they be delighted, or horrified, to see so many people entering these sacred womb-tombs? Below is a short video trailer of a film called "Remnants" made by Grant Wakefield. At 0:49s you can see some brief footage of the equinox illumination of the western passageway at Knowth. REMNANTS - 2k DCP - OFFICIAL TRAILER - 02 from GRANT WAKEFIELD on Vimeo. Hi Helen. That's very interesting. Would you have a reference that I can follow up about the Chinese luck stones? Cheers.